This is the brand to trust to get rid of the dust! Clean all those tight spots on your VALUABLE ELECTRONICS without accidentally damaging them. ★ Xbox, mobile phone, Lab Equipment. NO more problems dusting delicate areas in hard to reach places, without causing them to break. Use Dust Off to make the dust go away! Buy With Confidence! Our Product comes with a 100% Customer Satisfaction or YOUR MONEY BACK GUARANTEED. Find the ADD TO CART button on the top right of the page to get your Value Pack Today! 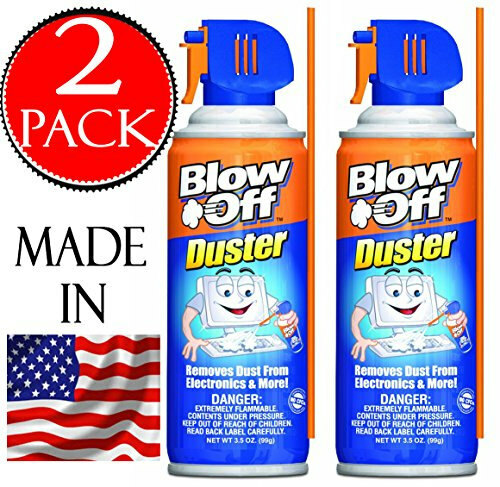 Value 2-PACK – Made in the USA, Non-toxic & no bitternt, NO nasty smells or residue left on the surface.Prolongs the life of your valuables & sensitive electronic equipment, Stops the build-up of dust in your electronics, Keeps your computer fan & circuit board dust free, crucial for better performance & a longer life.Blow Off cleans dust with a steady stream of sterilized air, an essential cleaning tool for all your expensive equipment.A dusty fan in your electronic devices (Xbox, Desk Top or Computer) can make the components overheat & worst case scenario, start a fire.Discover the difference Blow Off can make to your everyday cleaning at home for delicate dusting jobs in hard to reach places, Keep your Fire Alarm dust free & running properly.